THANK YOUS: For of all, we’d like to thank Rev. Winnie Varghese and Roger Jack Walters from St. Mark’s Church for telling us some wonderful stories on a sunny Sunday afternoon as volunteers worked busily to repaint that 1838 iron fence. This is one landmark is really good hands! 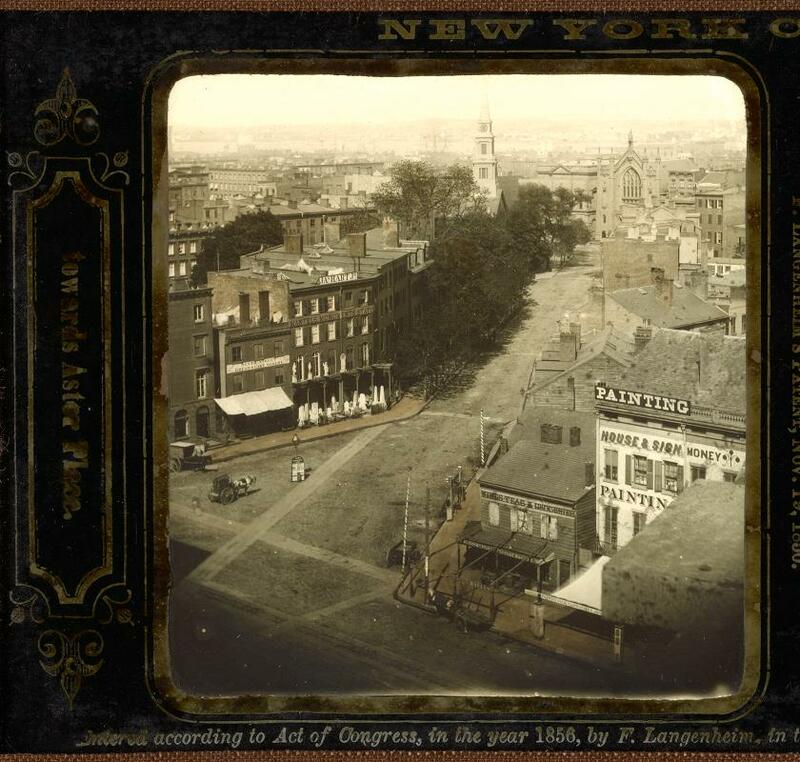 The Park Theatre (pictured at right) is considered New York’s first great theater, sitting on Park Row in the days before there was a City Hall, a Printer’s Row or anything else recognizable or familiar about that area today. 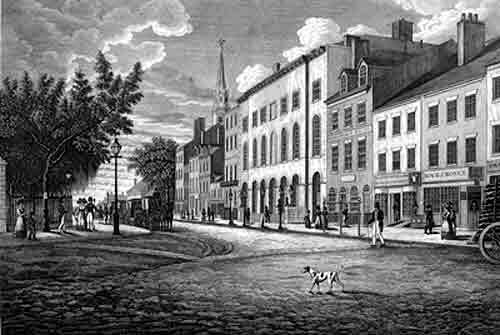 The stage entertained British officers during the Revolutionary War, and in the early 19th century presented entertainment of the highest class. The PRICE buried in the old St. Mark’s Cemetery is most likely its former manager Stephen Price, who specialized in importing British stage stars for their American debuts. One of those was Julius Brutus Booth, who debuted Shakespeare’s Richard III here in 1822. Booth’s children Edwin Booth and John Wilkes Booth would enter the acting profession in the mid-19th century. But who’s the BARNES? Most likely it was English actor John Barnes who frequented the Park and died in 1841. However, his wife Mary, billed as Mrs. John Barnes, was in many ways a bigger star, the resident ‘heavy-tragedy lady‘ who made here debut here in 1816. The two often appeared on stage together — husband for the comedy, wife for the drama. JAMES BOGARDUS: The portico of St. Marks is one of the last remaining examples of original cast-iron construction designed by Bogardus, but there are four other buildings in New York attributed to Bogardus that still exist: 254 Canal Street, 85 Leonard Street, 75 Murray Street and 63 Nassau Street. In TriBeCa today, you’ll find Bogardus Garden, a lush, green-fitted traffic triangle. Bogardus is buried at Green-Wood Cemetery. FURTHER LISTENING: Although Augustus Stuyvesant was the last living direct descendant, there are others named Stuyvesant that trace their lineage to Rutherford Stuyvesant. To find out why this doesn’t quite count, listen in to my podcast on Rutherford’s pet project The Stuyvesant apartment, New York’s first of its kind. (Episode #131: The First Apartment Building). SLIP UPS: This weeks verbal slip-ups include me saying ‘St. Mark’s ON-the-Bowery’ twice (it’s referred to in many ways, but never that).